A study was done to determine if the differentiation and activation phenotype of T cells in synovial fluid (SF) from patients with juvenile idiopathic arthritis (JIA) is associated with T-cell proliferation in situ. Mononuclear cells were isolated from 44 paired samples of peripheral blood and SF. Differentiation and activation markers were determined on CD4 and CD8 T cells by flow cytometry. Cell-cycle analysis was performed by propidium iodide staining, and surface-marker expression was also assessed after culture of the T cells under conditions similar to those found in the synovial compartment. The majority of the T cells in the SF were CD45RO+CD45RBdull. There was greater expression of the activation markers CD69, HLA-DR, CD25 and CD71 on T cells from SF than on those from peripheral blood. Actively dividing cells accounted for less than 1% of the total T-cell population in SF. The presence or absence of IL-16 in T-cell cultures with SF or in a hypoxic environment did not affect the expression of markers of T-cell activation. T cells from the SF of patients with JIA were highly differentiated and expressed early and late markers of activation with little evidence of in situ proliferation. This observation refines and extends previous reports of the SF T-cell phenotype in JIA and may have important implications for our understanding of chronic inflammation. The role of the T cell in initiating or perpetuating chronic inflammation is unknown. Juvenile idiopathic arthritis (JIA) encompasses a heterogeneous group of chronic inflammatory diseases, characterised by persistent arthritis beginning before the age of 16 years. It is classified into subgroups according to associated clinical features . In several subgroups of JIA, there is indirect evidence that infectious agents play a role in either initiation or perpetuation of the inflammatory process [2,3,4], but the role of one or more intra-articular antigens in contributing to the observed expansion of synovial T-cell numbers is unclear [5,6,7]. Previous research has shown that synovial T cells in JIA appear to have an activated memory phenotype [8,9,10,11,12], but only one study has addressed the role of in situ proliferation in contributing to this phenotype . We hypothesized that a proportion of T cells from the synovial fluid (SF) of patients with JIA were activated in situ by antigen-driven cell cycling. Such T cells would be expected to demonstrate a memory phenotype (CD45RO+) with markers of recent activation and impending or recently completed division, in particular CD69, CD71 and CD25. We also proposed that the differences in disease pathogenesis between JIA subgroups would be reflected in different patterns of T-cell phenotype and activation status. Forty-four paired samples of SF and peripheral blood (PB) were obtained during therapeutic arthrocentesis (for intra-articular corticosteroid administration) from 31 patients who fulfilled criteria for the diagnosis of JIA (Table 1). Samples were collected from 12 patients on two separate occasions and from one patient on three occasions. Ethical approval for the study was obtained from the local research ethics committee and all patients and parents (as appropriate) gave their informed consent for sampling of SF and PB. ANA = antinuclear antibodies; F = female; M = male; RF = rheumatoid factor. Mononuclear cells (MCs) were isolated from SF and PB by the standard method of ficoll (Amersham Pharmacia Biotech, Sweden) density centrifugation . Three-colour staining of MCs was carried out using a standard protocol . The antibodies used were CD4-BIO, CD8-BIO, CD25-FITC, CD69-FITC and HLA-DR-FITC (Becton Dickinson, Oxford, UK); CD71-FITC, CD45RB-FITC, CD45RO-FITC and CD3-PE (Dako Ltd, Bucks, UK). Immunofluorescence was detected using a Beckman-Coulter flow cytometer (Bucks, UK). Dead cells were excluded by gating on forward/side scatter and T cells were selected by gating CD3+ cells. Marker expression was recorded as either percentage of positive cells (% positive), if there was little overlap between the marked cell population and the control, or as median fluorescence intensity (MFI) if there was significant overlap between the two populations. Because of variation in the numbers of cells isolated from SF and PB, it was not possible to stain each sample using the full range of monoclonal antibodies (as noted in figures and tables). At least 5 × 106 MCs were analysed from PB and SF of five patients (two with psoriatic arthritis, two with polyarthritis and one with oligoarthritis). Cells were fixed in 70% ethanol for 24 hours. After washing, the cells were stained with propidium iodide for 30 min at 4°C. Staining was again detected on a Beckman-Coulter flow cytometer and data were analysed on WinMDI version 2.5 in accordance with 'Cell-cycle analysis: a pragmatic approach' hoy@cf.ac.uk. Cells were gated to exclude dead cells, doublets and triplicates. We attempted to upregulate expression of activation markers on T cells from PB by exposing them to a microenvironment similar to that found in the synovial compartment. T cells were cultured overnight in a 1:2 dilution of autologous, preservative-free and fetal-calf-serum-free SF with or without hypoxic conditions (95% nitrogen 5% CO2) for 24 hours, and with or without 200 ng/ml IL-16 (Serotec, Oxford, UK) for 48 hours. Statistical analysis was performed using GraphPad prism software. Mann–Whitney tests and Wilcoxon t tests were performed where appropriate. A greater proportion of T cells from SF expressed activation markers than of T cells from PB (Figs 1a and 2a). 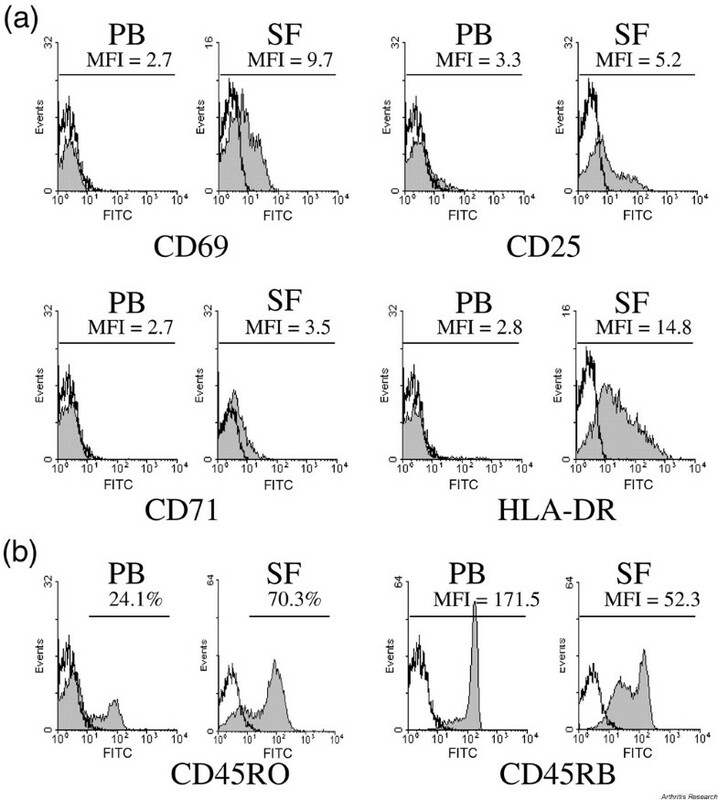 The greatest differences were seen for CD69 (MFI for T cells from SF and PB 13.2 and 2.7, respectively; P = 0.0002) and HLA-DR (MFI for SF and PB cells 19.8 and 2.9, respectively; P < 0.0001). CD25 and CD71 were also significantly increased in the SF T-cell population (respective SF:PB MFI 4.1:3.3 and 3.7:2.7), but the differences between SF and PB were not as dramatic as for CD69 or HLA-DR. CD8 T cells expressed significantly higher levels of CD69 and HLA-DR than did CD4 T cells, whereas expression of CD25 and CD71 was higher on CD4 than CD8 T cells (Table 2). Expression of activation and differentiation markers on T cells from peripheral blood (PB) and synovial fluid (SF) of a patient with juvenile idiopathic arthritis. (a) Expression of activation markers. (b) Expression of differentiation markers. Each histogram is a representative example of marker expression on PB or the paired SF sample. Marker expression was recorded as either percentage positive cells (CD45RO only), or as median fluorescent intensity (all other markers). The clear peak on each histogram represents the staining from an isotype-matched, negative control. FITC = fluoroscein isothiocyanate; MFI = median fluorescence intensity. Phenotype of peripheral blood (PB) and synovial fluid (SF) T cells from patients with juvenile idiopathic arthritis. (a) Expression of activation markers. (b) Expression of differentiation markers. Bars represent median expression on paired PB and SF samples. Because of variation in cell numbers isolated from each sample, not all samples could be stained for every antibody available. Each datum point represents an individual sample (n = number of samples studied). MFI = median fluorescence intensity. Values are median fluorescence intensity of the markers (except for CD45RO, which is expressed as % positive) on CD4+ or CD8+ T cells. *P < 0.05, **P < 0.01, ***P < 0.001, versus PB. The majority of the SF MCs were in phase G0/G1, with fewer than 1% in S phase (Fig. 3). There were no detectable differences in the percentage of dividing SF cells in comparison with cells from the PB compartment or between different disease subgroups (data not shown). Cell-cycle analysis of mononuclear cells from synovial fluid. (a) Representative example from a patient with oligoarthritis. (b) Positive control: peripheral blood mononuclear cells stimulated with phytohaemagglutinin for 3 days. In the absence of T-cell proliferation, we hypothesized that factors within the synovial microenvironment, such as hypoxia, which may induce the expression of the CD71 gene [14,15], or IL-16, which is thought to upregulate CD25 expression , would influence the state of the T cells. The expression of activation markers on T cells from PB was unaffected by culture in the presence of autologous, cell-free SF under normal or hypoxic conditions. Culture of PB T cells for 48 hours in the presence of IL-16 did not influence activation marker expression (data not shown). The SF T-cell population consisted mainly of highly differentiated memory cells: 78.9% expressed CD45RO, compared with 24.4% in the PB (P < 0.0001). This was reflected in the reduced expression of CD45RB on SF T cells (SF MFI 90.6, PB MFI 207.5; P < 0.0001) (Figs 1b and 2b). CD8+ T-cell numbers were higher (SF 45.3%, PB 29.4%, P < 0.0001) and CD4+ T cells lower (SF 39.9%, PB 58.3%, P < 0.0001) in SF than in PB. Interestingly, expression of CD45RO was significantly higher on SF CD4 T cells than on SF CD8 T cells (97.1% and 73.9%, respectively). Similarly, expression of CD45RB was lower on SF CD4 than on CD8 T cells (MFI 49.1 and 142, respectively) (Table 2). No consistent variation of T-cell activation or differentiation status was observed for most of the clinical parameters (Table 3). 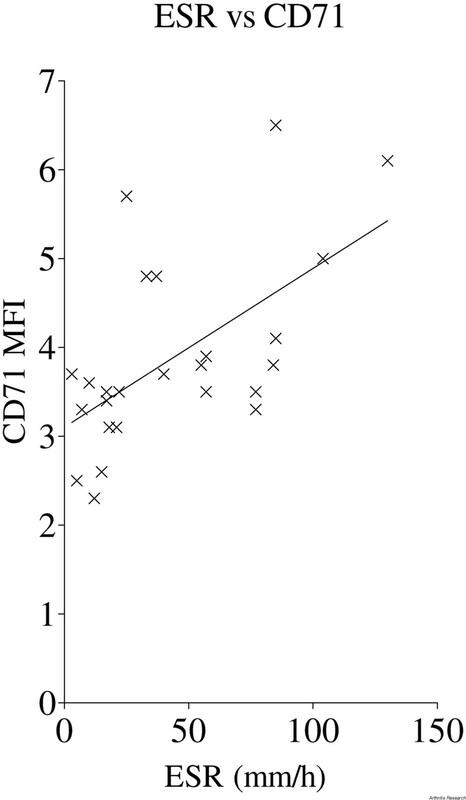 There was, however, an association between CD71 expression on SF T cells and the vigour of the acute-phase response as measured by the erythrocyte sedimentation rate (P = 0.0005; Fig. 4). Relation between erythrocyte sedimentation rate and expression of CD71 on T cells from synovial fluid from patients with juvenile idiopathic arthritis. Points represent individual synovial fluid samples. Data show line of linear regression (P = 0.0005). ESR = erythrocyte sedimentation rate; MFI = median fluorescence intensity. All values represented as median fluorescence intensity (MFI) except CD45RO, which is represented as median % positive. Patients were grouped according to disease subgroup (oligoarthritis, polyarthritis or psoriatic arthritis), and expression or absence of HLA-B27, ANA, a high or low acute-phase response (high: erythrocyte sedimentation rate >20 or C-reactive protein >5), and whether they had received intra-articular triamcinolone hexacetonide earlier in their disease process (drugs+ versus drugs-). There was a statistically significant difference between those groups of patients with a high or low APR (*P < 0.05). ANA = antinuclear antibodies; APR = acute-phase response; hi = high; lo = low; JPsA = juvenile psoriatic arthritis; Oligo = oligoarthritis; Poly = polyarthritis. In the chronic inflammatory process of JIA, it is unclear whether the observed accumulation of synovial T cells reflects local activation by one or more intra-articular antigens or reflects non-antigen-specific migration of memory T cells into the joint. To address this issue, we comprehensively studied the numbers of differentiated, activated and cycling cells within the SF compartment in JIA. In the JIA population studied, expression of all the activation markers on T cells was higher in cells from SF than than in cells from PB. Although this observation has been reported previously using CD25 and HLA-DR expression [9,10,11,12,13], the use of the very early activation marker (CD69) and the transferrin receptor (CD71) in our study has added an extra dimension to the understanding of the process of JIA. Antigen-induced T-cell activation in vitro is known to result in the expression of activation markers in an orderly sequence: CD69, CD25, CD71 and HLA-DR [17,18]. In our study, the upregulation of CD69 and HLA-DR appeared greater than that of CD25 or CD71, suggesting that these changes were not the result of antigen-specific activation. A similar T-cell activation pattern has been reported in adults with rheumatoid arthritis [19,20]. Expression of CD69 may be the result of cell–cell contact after transendothelial migration into the joint [20,21], and expression of HLA-DR does not necessarily imply recent activation, as it may persist on memory T cells . 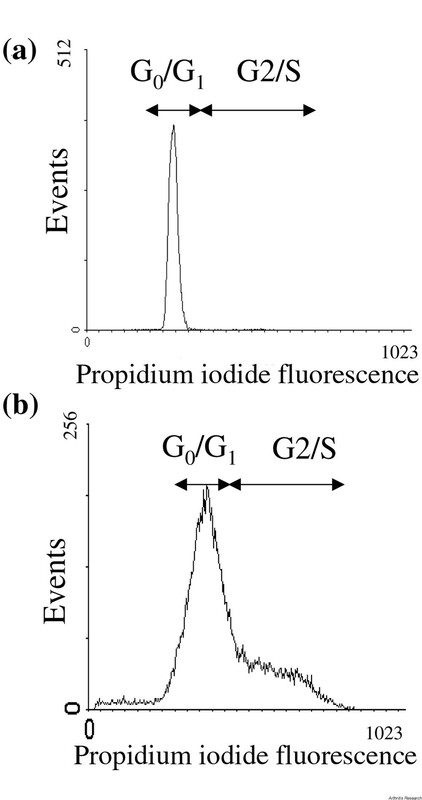 To further elucidate whether the expression of activation markers was induced by T-cell proliferation, we measured propidium iodide staining of SF T cells. The majority of the SF MCs were in phase G0/G1, and fewer than 1% were in S phase. MC proliferation was no greater in SF than in PB, confirming the observations Bergroth et al. made by a manual count of 3H-thymidine-labelled MCs in SF . This finding suggests that SF T cells in JIA express activation markers as a result of a proliferation-independent process. It is possible, however, that actively proliferating cells were lost during the cell-separation process. It is also possible that small numbers of SF T cells were actively dividing and driving a local inflammatory process, as antigen-specific T cells may be present at frequencies of fewer than 1/1000 in inflammatory arthropathies . Differences in the frequency of dividing cells between patient subgroups may emerge if greater numbers of patients are investigated. Alterations in the microenvironment have been associated with changes in expression of activation markers in the absence of proliferation . The SF compartment is relatively hypoxic and this may alter T-cell behaviour in vivo . Hypoxia has been shown to induce the expression of the CD71 gene [14,15], and IL-16 has been shown to increase T-cell expression of CD25 . In the JIA population studied, however, no detectable change in the expression of any activation markers on T cells was observed after culture in hypoxic conditions, or in the presence of IL-16. Additionally, overnight culture of SF or PB T cells with autologous SF did not induce upregulation of the activation markers. It is likely that many other factors within the joint, including the presence of synoviocytes, influence the activation state of synovial T cells. Research observations of relevance to the aetiology and pathogenesis of JIA may be masked by the heterogeneity of the diseases under the umbrella term of JIA . There was little evidence that different subgroups of JIA in this study were characterised by different patterns of marker expression, although the relatively small number of patients and samples may have obscured subtle changes. Further study of biochemical indices of cell activation in larger numbers of JIA patients may help to elucidate differences in disease pathogenesis in JIA patient populations with distinct clinical phenotypes. This study has revealed a number of other interesting findings of potential relevance for T-cell recruitment to the synovial space. The majority of SF T cells were CD45RO+CD45RBdull, a finding also made in adults with rheumatoid arthritis [26,27]. Such highly differentiated T cells are likely to be recruited to the arthritic joint because of an intrinsic increase in ability to bind to, and migrate across, inflamed endothelium [12,28]. When the T-cell subsets were examined, 74% of SF CD8 T cells expressed CD45RO, versus 97% of SF CD4 T cells. The observation that 26% of SF CD8 T cells did not express CD45RO raises the intriguing possibility that there is a large intra-articular effector population of CD8 T cells  or that a proportion of the memory CD8 T cells have reverted to the expression of CD45RA . The influence of the general inflammatory milieu on T-cell recruitment or retention in the synovial space has not been extensively reported. In this study, an association between CD71 and erythrocyte sedimentation rate was observed. This finding could indicate that factors governing the acute-phase response, such as proinflammatory cytokines, influence the activation state, and possibly the migrating capacity, of the T cells in SF. The T cells within the SF of patients with JIA have a phenotype that would support selective recruitment from the blood. Highly differentiated T cells, which have increased capacity to migrate across inflamed endothelium, may be selectively recruited to the joint, a process which, of itself, may alter the expression of activation markers on the cells in the absence of cell proliferation. This is the first time that such a T-cell phenotype has been demonstrated in patients with JIA. We thank Professor M Salmon and Dr D Pilling for helpful advice during this research. We also thank Professor P Bacon, Dr C Buckley and Dr L Wedderburn for their critical reading of the manuscript. This work was funded partly by the Arthritis Research Council and supported by the Henry Smith's Charity.